Stride by Stride: Come on, Illinois Derby, Mama Wants to See A Strong, Happy Horse, Kentucky Derby Contender! Come on, Illinois Derby, Mama Wants to See A Strong, Happy Horse, Kentucky Derby Contender! Kentucky Derby season has sneaked up on me this year. Maybe it's because I held out hope that I'd get to see Doug O'Neill's Bond Holder run a few races in prep. Alas, one wild Fed Ex plane ride later (one, I sadly recall as Mr. Fed Ed gone awry) and all those dreams went out to pasture, and have yet to return to the barn for proper grooming. Hang in there Bond Holder. Take care of yourself. I look forward to getting to see you do your thing in your 4-year campaign. One exciting race taking place today, unfortunately without, the impressive Mr. Bond is the Illinois Derby at Hawthorne Racetrack. Contenders include: Global Strike, A Step Ahead, Dynamic Impact, Class Leader, Emmett Park, Midnight Hawk, King Cyrus and Irish You Well. Officially listed as long shots, A Step Ahead, Irish You Well and Emmett Park are obviously the most fun bets to make if you're looking for nail biting excitement. As I just trimmed my nails and have nothing left to bite, I'll be sticking with, Lord help me, please Bob Baffert don't be administering Thryo-L to poor little Midnight Hawk unless he actually needs it, Midnight Hawk. He is a beautiful horse who certainly has proven that he's got the chops to win. It also doesn't hurt that he's owned by some people who live in the best city on the planet, my home town--CHICAGO!!! A big shout out to Rosie Napravnik, who never disappoints when she races. 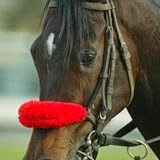 I'd love to see King Cyrus cross the line first and it could certainly happen with Ms. Napravnik riding shotgun. If you're late to the starting gate, like I am this year, but still want to place a bet for the Illinois Derby check out this link: Twin Spires. Also, check back later as I'll be posting the race as soon as it becomes available online. And most importantly, don't forget post time is 1:45pm cst. Update: O'Neill Racing sadly reported, moments ago, that the spirited, beautiful Bond Holder whose been fighting laminitis since his horrible plane flight a few months ago, has finally succumbed to his illness. He will be deeply missed by his humans and trainer(s) at Team O'Neill as well as his owners at Reddam Racing. Poor Bond Holder. When does life get fair? Please email me the date because I'd like to wake up bright and early that morning and take it all in, every second.